Last night was evil. Howling wind, driving wet snow – everything you would expect from an early winter storm. Interestingly this morning it was all washed away, the result of temperatures increasing to well over 0°C overnight. I have an answer. Zuppa Toscana. Tuscan soup. Simple, hearty and something that can feed a crowd without breaking the bank. By the way, Tuscan soup is more than the chicken and cream variety you get at Olive Garden. Simplicity is central to Tuscan cuisine. Beans, bread, cheese, vegetables, mushrooms and fresh fruit are common ingredients in everyday cooking. Traditional Tuscan cuisine, regardless of if it’s served in a Milanese restaurant or farmhouse kitchen, has is roots in peasant cooking. 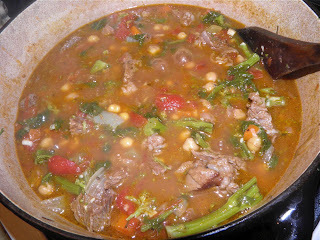 Because of this simplicity the dishes are very hearty and filling. They are also frugal. A good example is the use of thickening of soup bases by the introduction of day-old bread. Nothing goes to waste. 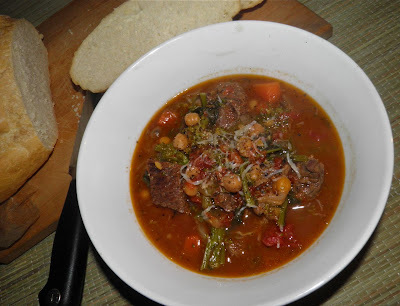 There are many diverse recipes for Tuscan soups, from vegetable minestrones (I make a mean one with no tomatoes) to seafood soups. Each area has soups that are traditionally prepared in their kitchens. Much of what we call “Italian cuisine” actually has its roots in the cities, towns and villages of Tuscany. This soup is a great one. It takes a bit of time (slightly more than an hour) but the result pays off for watching a pot. Heat the olive oil in a Dutch oven or similar pot. Add the onion, garlic, celery and carrot. Cook for 5 minutes until the onion begins to become translucent. Add the beef and cook until no longer pink, about 5 minutes. Add the beef broth, tomatoes and their liquid, the rosemary, thyme and oregano, and some salt and pepper. Cover and let cook for 30 minutes. 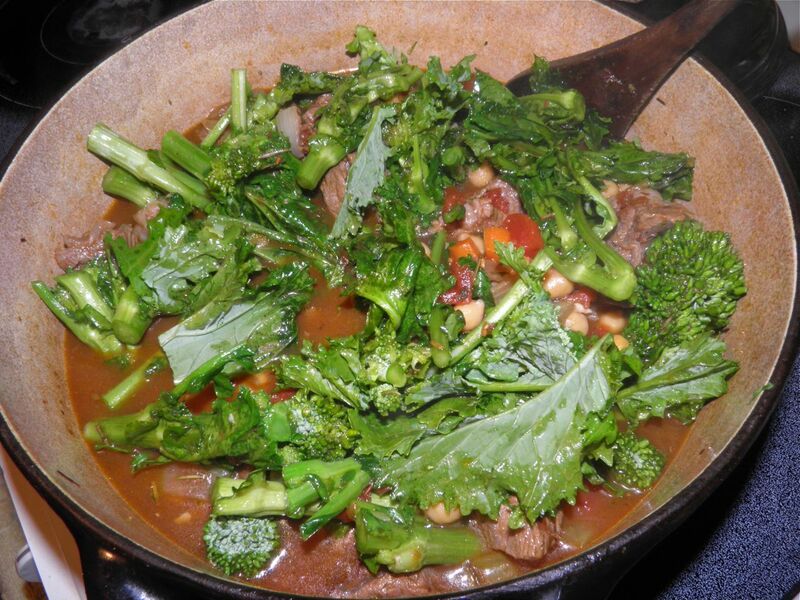 Wash the kale and rinse the chickpeas. At the end of the 30 minutes, roughly chop the kale and add it, and the chickpeas, to the pot. Cover the pot again and let cook for 20 minutes. Then add the grated parmesan and grated bread. Stir in and let the mixture cook for another 5-10 minutes. Taste for salt and pepper and adjust. 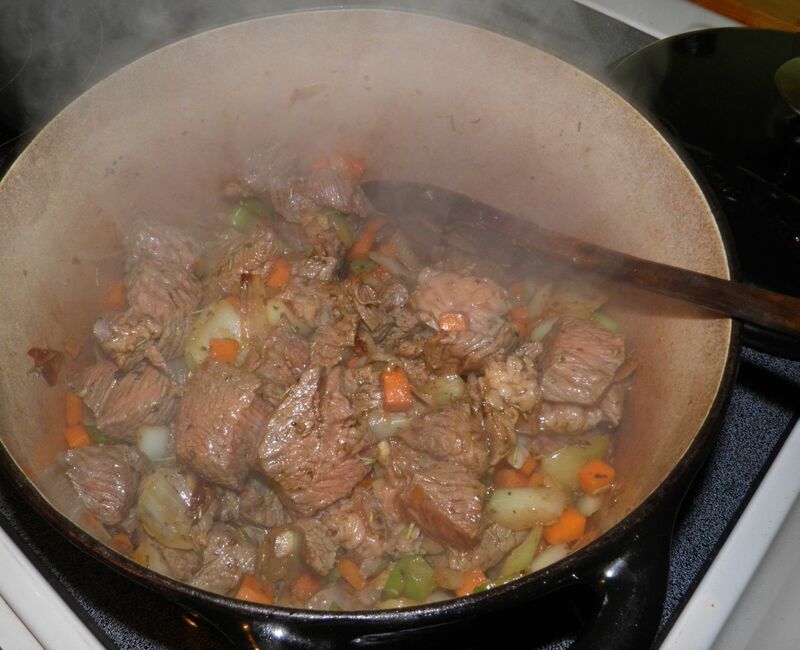 Serve with crusty bread to sop up the delicious juices.